ASCON Resource Management Corporation advances the circular economy through materials collection and recycling, and management of Extended Producer Responsibility (EPR) systems. Founded in 2016, ASCON Resource Management Corporation is a wholly owned US subsidiary of ASCON Holding company, a leading global circular economy firm based in Bonn, Germany. ASCON has over two decades of experience in developing and implementing collection and recycling systems for a variety of materials, including agricultural films, automotive parts, pharmaceuticals, and consumer packaging. ASCON's global footprint provides access to multiple recycling markets throughout Europe and Asia, providing reliable and responsible recycling solutions to customers worldwide. ASCON has the technical expertise and an extensive network of global relationships that provides access to cost-effective and value-added partnerships in the circular economy. 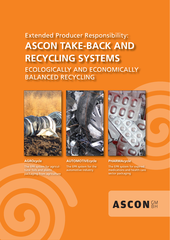 ASCON buys and sells recyclable commodities collected through its own managed systems and also on behalf of customers seeking to avoid landfilling and incinerating valuable secondary raw materials. ASCON is a trusted regulatory services partner that manages European Union EPR (Extended Producer Responsibility) obligations for over 150 companies doing business in the EU. ASCON has over two decades of experience in finding value in the circular economy, including numerous projects in the European Union, in the UAE and in Central Asia. Furthermore, multinational companies are responsible for complying with an array of EPR obligations, such as the EU Waste and Packaging Directive and the Waste Electrical and Electronic Directive (WEEE). ASCON is experienced at managing company EPR obligations in the EU and is a trusted resource for North American companies seeking cost effective solutions. ASCON offers consulting and supervision of internationally active American companies to meet their packaging-legal obligations of the European Union.